Did the Argentinians use Harriers too? tokle wrote: Did the Argentinians use Harriers too? Good point ... no they used Skyhawks while the British had the Sea Harriers. The links have pictures of the planes. Note that other types of planes were also used. While I am at it, I will change the Englich helicopter to a sea king. Did the redraw on the planes. Changed the (A) planes to the Skyhawk and the (B) helicopter to the Seaking. Also did a slight adjustment to the ALZ1 so it does not sit on top of the forest now. Had a go at arrows too. Yeah, nice! Looks done to me. Also I'm thinking that when you do the small you will have problems with the legend area as a whole. Since you have some room at the bottom of the playable area of the map, shuffle the ARA ships and names around and increase the size of the legend height-wise. With the moving of the Enemy=Opposing nation, you can increase the font size a bit so that it will be readable on the small. I also have the reference to the enemy planes in the air force section. If I use your suggestion, then logically I need to put it there as well. As people normally read from left to right, if I put the rules of engagement on the left of the legend so this is going to be what most people read first, it should solve the problem. Either that, I need to place it with the airforces. isaiah40 wrote: Also I'm thinking that when you do the small you will have problems with the legend area as a whole. Since you have some room at the bottom of the playable area of the map, shuffle the ARA ships and names around and increase the size of the legend height-wise. With the moving of the Enemy=Opposing nation, you can increase the font size a bit so that it will be readable on the small. I have got extra room for the legend in the small by using the sea territs at the top of the board, airforce strip and some pixels in the large legend. So the small legend will take up a bigger percentage of the map (not much more, between 5-10%)) but with so many different parts of the legend (each draft has gotten more rules added to it), this is the only way to squeeze it all in without applying for a larger small version which is not what I would like to do. Let me get the small legend made up today for you to see what I mean. Here is the small legend with the above change of moving the rules of engagement to the left. It needs a little work to make nice but with the text at 8 pixels, it seems pretty clear without being overly small and hard to read. This image for the small legend is 189 pixels high compared to the large maps 219 pixels. I can get the extra room from the top and bottom of the map where the land and sea territs are extra large. So the map will still look identical apart from the top which would look a little smaller on the small map. Do I need to still move the opposing nation/player to the navel and air force parts of the legend? I believe that should work as the Enemy=Opposing force would be remembered as the rest is read. Can you post the small and large so I can see them please? They can bombard the whole fleet. As you can see, not much of a dent into the small map as I was only getting the spacing sorted out before continuing. Thank you, I think that will work, so get back to work!! Here is the new legend layout. Will get on and do the small map if stamped now. If anyone has any gameplay concerns/suggestions/ideas, speak up now as I am thinking of stamping this is the next 48 hours. it still reads that aircraft can bombard enemy navel forces. tokle wrote: it still reads that aircraft can bombard enemy navel forces. What do you mean by ??? 1982 was the year of the conflict. Guerra de las Malvinas is the name the Argentinians give to the conflict. Falklands war is the name that the British give it. Why is it all pixelated? I think it looked better solid a few versions ago. I also agree with gillipig about the woods. Didn't you try the same look on Rorke's at some point? I also don't think the sea mines look much like sea mines, but those are just nitpicks and just my opinion. lostatlimbo wrote: Why is it all pixelated? I think it looked better solid a few versions ago. Sorted out the pixelation. Made the woods darker and they do look less fake. Do not want to go down the route of tree icons. And no, I never did this on Rorke's Drift. How can you draw a mine. It is a half circle with lines coming out of the top. They are small and supposed to be hard to see. I think I did a pretty good job on these. With that and the anticipation of a stamp, here is the latest large image and the first full image of the small map. Less room than I hoped for on he right so two of the ships are slightly smaller than the others. Added a glow to the small sea territ names as with the smaller font it was a little hard to read. The flags have to be moved also to make room for the army numbers incase of 3 digit games. I am happy with the gameplay, so I do hereby declare 1982 stamped!! 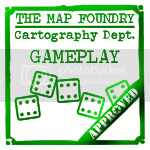 The stamp does not constitute the final gameplay, as the mapmaker is still required to address any issue relating to game play after the stamp has been given.